While Taco Bell invites us to “Think Outside The Bun”, today’s game is all about thinking inside the bun, with Build A Burger. This is a fun team relay game that you can play in any group setting. Before beginning the game, you will need to cut large pieces of paper or Styrofoam to create “toppings” for your burger. Paper is your easier option, since you can pretty much just cut out shapes, but Styrofoam gives it dimension to look more like a burger. 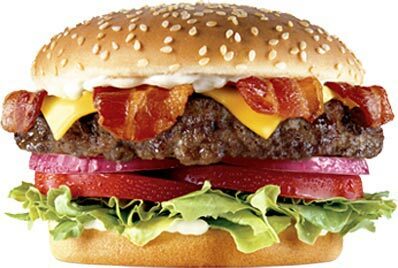 We recommend the following toppings along with the patty: cheese slice, tomato, lettuce, pickle, 2 pieces of bacon. You can add onions or extra patties if you want as well. Once you have the toppings, find two pillows that will act as your buns (if you don’t have a pillow that looks like a bun, white pillows work well as a sandwich bread and you can still use the same toppings). Place the toppings in a straight line from one side of the room, while your “bottom bun” serves as the starting point. For example, you would have the bottom bun (one half of team) lying on the floor with the patty lined up about 10-20 feet away, then place the cheese slice, tomato and so on. Once everything is in place tie the pillows to the front of the two contestants. One contestant will serve as the bottom bun and the other will be the top. The goal of each team is to create their burger in the fastest possible time or before the other team. This is done by having the “top bun” corale the patty and toppings one at a time. They must begin by running to the patty, picking it up and placing it on the bottom bun, which must remain stationary on the ground (they can use their arms to help secure the toppings). Once this is done, the top bun must then run to grab the cheese and place it on top of the patty. This continues until the bacon is placed on top, then everything is completed when the top bun closes the burger by jumping on top of the bottom bun and all the toppings. First team to complete the challenge wins! 1. If you would like to extend the game out some, have multiple teams race in heats or simply time them and award the winner based upon who finished fastest. This also works great as a game for people to play at a larger event while other things are going on. You can post the fastest times for different age groups and award prizes for people who beat those times. 2. If you are in a place where the game can not be seen, have the bun stand up so they can be seen. It’s not ideal, but it’s better than missing the whole game because it was impossible to see. 3. Award the winning team burgers, gift cards to a burger joint or a day where they can have lunch with you at a great burger place.